Swansea City Centre boasts a vast array of specialist independent retailers offering a wide range of unique and designer products and services, all just a stone throw away. Many of these stores are situated in Swansea’s Independent Quarter which features; Plymouth Street, Nelson Street, Oxford Street, Singleton Street, Dilwyn Street, and also includes Picton Arcade and Shoppers Walk. 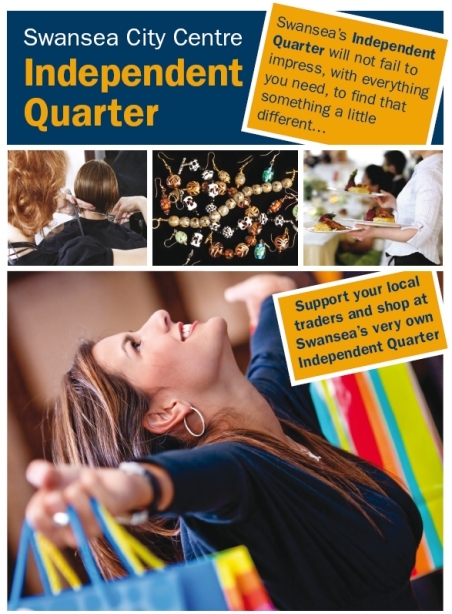 You will also find a variety of independent traders situated on High street, St David’s shopping centre, Castle street, College street, The Kingsway and Craddock street. A visit to any one of our independent outlets will surely not be your last, with customer service that’s second to none. Our traders pride themselves on knowing their customers and with service like that, who would want to shop anywhere else? Results from a skill smart survey commissioned by Swansea BID published in 2012 evaluated the performance of 37 independent retailers in the city, producing an average score of 92.5%, placing Swansea third out of 88 town and cities across the UK. Now that’s something to shout about!